"The cross-clamp is on: Begin antegrade cardioplegia," the surgeon commanded. Nina Paugh, CCP, initiated forward flow on the cardioplegia pump and administered cardioplegia. "The heart's still beating," the surgeon declared after 15 seconds. Ms. Paugh calmly began problem solving. She re-checked the cardioplegia system for the appropriate cardioplegia concentration, delivery temperature and the system pressure. She quickly responded, "My cardioplegia system pressure is too low, Doctor, please confirm the position of the cross clamp on the aorta." The surgeon repositioned the aortic cross clamp, the cardioplegia arrested the heart, and the surgery proceeded. While this scenario occurs in operating rooms daily, this particular exchange took place during a perfusion simulation at the AmSECT Perfusion Safety and Best Practices Meeting in New Orleans last June. In this case, Nina Paugh, a perfusionist at University of Michigan Medical Center, was role playing in a training exercise. AmSECT invited manufacturers to set up perfusion simulators as part of the hands-on seminar. Manufacturer representatives were the 'surgeon' and 'anesthesiologist.' Each perfusionist ran a number of routine scenarios with each simulation lasting 20 minutes. "The surgeon and anesthesiologist were dressed in scrubs, and I had a mask and surgical cap on," says Ms. Paugh. "I found it to be about as close to the actual surgery as it can get." The skills required for perfusionists to multi-task and react to events have been compared to those of an airplane pilot. Just like pilots can participate in simulation exercises to hone skills, perfusion simulators can improve performance for those involved with open heart surgery. "Perfusion simulators allow you to practice urgent and emergent scenarios under realistic, real time conditions," says David Fallen, Director of Perfusion Clinical Support at Terumo Cardiovascular Systems. Perfusion equipment today is more reliable and more robust than several years ago. "When I started in perfusion in 1981, dealing with equipment issues during surgery was much more prevalent," Mr. Fallen recalls. "The benefit of simulation is in a realistic environment you can perform a critical, but extremely low occurrence situation — like changing out an oxygenator. Doing it while the 'surgeon' is waiting for you and offering you words of 'encouragement' — the stress level in that simulation is nearly equal to what a perfusionist would experience in the OR. "Today, it might be possible for a perfusionist to practice for years without dealing with a product changeout scenario while on bypass — a testimonial to the research and development and quality efforts of manufacturers," he adds. Simulating emergency situations can improve skills and clinician's response time. "By practicing these events, you develop a mental image of what needs to take place," Mr. Fallen adds. "The simulator was a very beneficial experience," says Ms. Paugh. "We are in the process of trying to implement a similar program at the University of Michigan." Terumo Cardiovascular Systems has two Orpheus Cardiac Perfusion Simulators in Ann Arbor. One is set up in the Virtual Operating Room and is used as an education tool for customers. Clinicians who are interested in trialing Terumo equipment can see how each component works under realistic conditions. "Talking with others, we believe there is a great future for simulation in perfusion," says Ben Komorowski, Clinical Specialist at Terumo Cardiovascular Systems, who role-played as the surgeon during the simulator sessions in New Orleans. "For example, our profession could use simulators to recertify perfusionists. 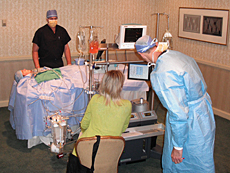 A perfusion simulation training exercise at the AmSECT Perfusion Safety and Best Practices Meeting in New Orleans in June 2009.